A couple of points here: first of all, yes, lose the uZeus immediately. Never add a power supply to a powered rack (unless it's something for a specific module, such as for some tube modules). And more VCAs is good. The Optomix is actually a pair of low-pass gates, which consist of a tandemmed low-pass VCF and a VCA, and this is fine for controlling audio levels, but having a couple of linear, DC-coupled VCAs for controlling CV and modulation levels is also strongly advisable. Beyond that, I would suggest looking into a couple of dedicated envelope generators, ADSRs in particular, plus a couple of LFOs. While the Maths can do both of these things, it's much better when it's used for complex modulation curves, using its own internal subsections to create complicated CV/modulation patterns that go beyond what basic EGs and LFOs do. As for Rings and Clouds, keep in mind that Mutable discontinued Clouds quite some time ago, but they still make the Rings module. However, both are available as third-party builds from several manufacturers...which is a bit of a plus, as those companies offer these in smaller form factors than their originals. Or maybe this: https://www.kvraudio.com/product/ctunerbyc_plugs That offers you MIDI note, frequency counting, metering with deviation in cents, plus a per-cents calibration mode. The latter two features make this quite useable for microtonal work, as well. NB: the markup syntax here sorta munges the URL above, but going to KVR and searching for CTuner should suffice. For starters, you need to change your case width. The Mantis is 2 x 104 hp. Once this is the right size, then you should have a much better idea about remaining space. Nope, this won't work. There's a lot of essential items missing here: no VCAs, no envelope gens, no LFO, nothing random, no noise sources, no mixers, no attenuators, and there's unnecessary things in here (Rainmaker, Ears). Plus, if you're trying to do decent sound design and ambient work, you're either going to have to resort to very small modules (6 hp and down) or expand the case, or (better) both. Let's think ahead, also. You will want to expand this eventually. This means that your case situation needs to be thought out for this in advance. My take on this is that you should look into Intellijel's 4U x 104 hp case, a rather sturdy aluminum skiff-type cab which comes fully-powered for $319, and which can easily be added to later via Intellijel's joiner plates and more of their cabs. The other reason for 4U here is that you can take some of the basic functions and put them into the 1U tile row. 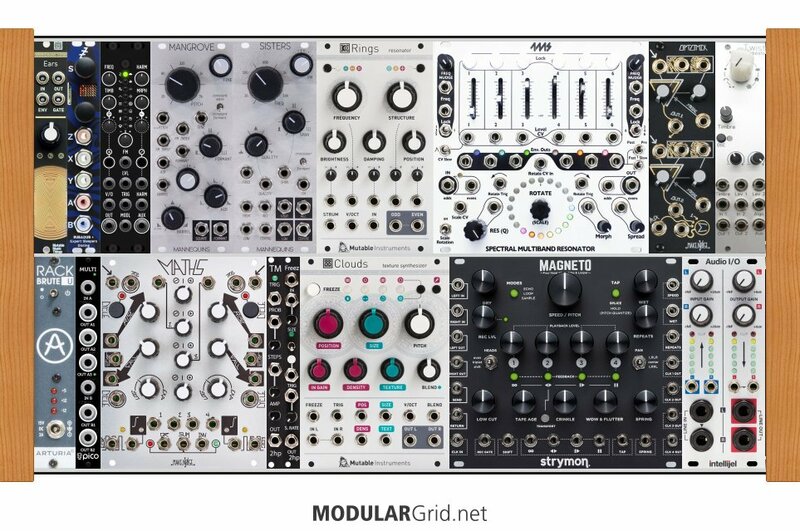 You're limited to Intellijel's tiles (the 1U row here doesn't take the "standard" tiles) but they offer most of your necessary basics (ie: MIDI, mixing, sample & hold/noise/clock, audio I/O, etc). Next, shrink the hell out of things in the 3U row. Don't use single-function modules if you can help it, and keep the module widths as low as you can. Even if this raises the cost some, the end result will be more function packed into the build, which means more capability for what you want/need. Also, limit what goes into this to pure functionality; if you can move 3U functions to the 1U row via a tile, do so. Avoid mult modules since they waste space in smaller builds and use stackcables or inline mults. See how far you can go without compromising ergonomics and playability (which, if you go too small, you run a real risk of doing). Plus, if you can do anything outboard (such as effects processing), do so...leave the space in the cab strictly for things which cannot be replicated outside of it. Lastly, remember that a synth has to have aspects of these four functions: generators (VCOs, noise, etc), modifiers (VCFs, VCAs, ring mods, waveshapers, etc), controllers (mixers, MIDI interfaces, joysticks, clocking, sequencers, etc) and modulators (LFOs, envelope gens, sample & holds, etc). If your build doesn't have parts from all four of these synth "food groups", it's not going to function well.